1Department of Pharmaceutical Sciences, Faculty of Pharmacy, Beirut Arab University, 115020, Beirut, LEBANON. 2Faculty of Pharmacy, Al-Zaytoonah University, 11733, Amman, JORDAN. Objective: Plants of genus Salvia are used in traditional folk medicine for their antidiabetic, anti-oxidant effects and for gastric disorders. The oil has an antiseptic property and it is used as a fragrance in soaps and perfumes. An infusion of the leaves is widely used as a mouthwash or gargle and for the treatment of inflammation of the mouth and throat. It is used as carminative, antiinflammatory, astringent, cytotoxic and antispasmodic. Materials and Methods: Air-dried powdered aerial parts and roots of Salvia fruticosa libanotica were extracted separately with ethanol and acetone then their residues were separately extracted with different solvents on silica gel columns. Results: From Salvia fruticosa libanotica, eight phenolic compounds were isolated from methylene chloride, ethyl acetate and butanol extracts of the chosen plant. The chemical structures of the isolated compounds were determined by NMR, MS, IR and UV spectroscopic methods. Conclusion: Among these compounds three Flavonoids named apigenin, luteolin and rutin were identified in addition to three phenolic acids which are ferulic acid, gallic acid and rosemarinic acid from aerial parts. Moreover, carnosol and dehydro-abietic acid were also isolated from Salvia fruticosa libanotica root extract. 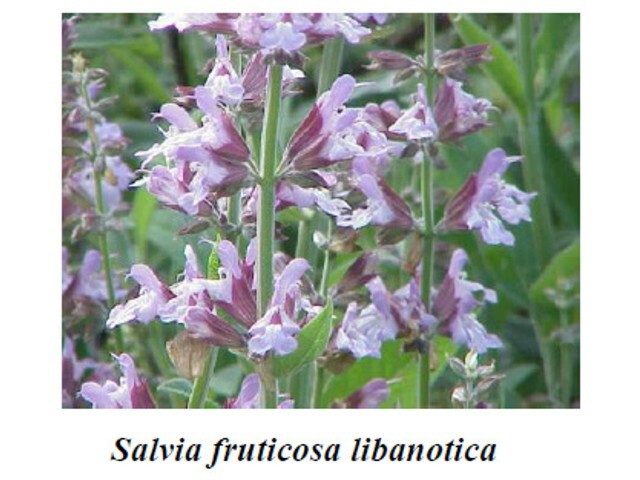 All the isolated compounds were obtained for the first time from Salvia fruticosa libanotica . Boukhary R, Aboul-Ela M, Al-Hanbali O, El-Lakany A. Chemical Constituents from Salvia fruticosa libanotica. Pharmacognosy Journal. 2018;10(1):45-48.